You would think that with my niece’s wedding in two days my sister (the mother of the bride) and I would focus on the wedding. But not us. After a day of running wedding related errands, my sister and niece were putting together a display about our family weddings, when my sister and I got into a mini dispute over a wedding date. This lead to my sister logging into her ancestory account to check the date, which of course led us into a lengthy look into our family mystery: our paternal grandfather’s family. Once again we started searching for his family on the census documents and in other areas. We know his birthdate and the names of some of his siblings. And we think we found his family. We knew of six siblings in his family. We are now up to eight in the 1905 census. But there is one brother not yet listed. And we cannot find another census with the family listed. So we honestly do not think this is our family. We need to investigate more. But that is not our only mystery. Sometimes the documents have all but one child born in the USA. Others show all but one born in a Russia. Some say the father, our great grandfather came in 1880 or earlier. Others say 1890. We know he was born in 1859 and his wife in 1865 we know they married in 1883 and started having children in 1885. The biggest problem is their very common names. If only we could find documents with the original last name of Grau instead of looking for Rosenberg. We know our great grandfather abandoned the family when our grandpa was about 13. It is now looking as if grandpa might have been a bit older. The names are so common that we have to be careful we are staying with the right family when we search. And it is difficult and confusing. 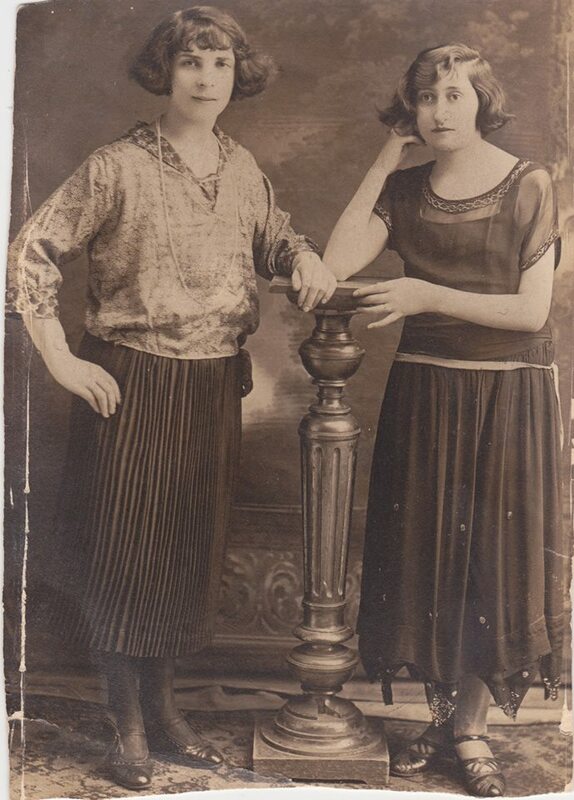 In the midst of this research, while I was looking for a post relating to my paternal grandfather’s family, I found a post I put up a while ago of two young girls which was never translated. This lead us down another path and, thanks to a Tracing The Tribe member, connected us to a relative on my maternal grandmother’s family. I need to do a bit more research before I can write about this photo. But we have found a photo of my grandmother and what looks to be this woman. We know my grandmother visited family in Breslau in 1931, where this woman lived. And we know her mother has the same name of our great grandfather’s sister. So we are pretty sure she, this women murdered in The Shoah, is grandma’s first cousin. My sister and I love mysteries and searching for our family in Europe. Identifying our family who perished in the Shoah is important to us. We want their names to stay in our memories. So at my niece’s wedding, I sat with my mother’s first cousin and showed her some of the information. Sometimes she remembers a name or knew someone that my siblings and I never met. 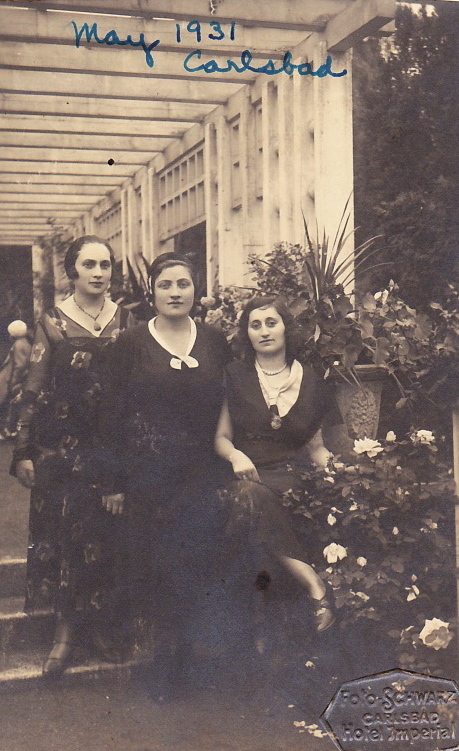 My grandmother left Poland when she was 16 in 1922, while my great aunt stayed until 1936, when she was 22. So she had stronger connections with the extended family in Poland right before the war. However, with this family member, my cousin had no memory to share. In fact she did not seem to know about the cousins my grandmother visited in Breslau in 1931. However she reminded me that my grandma was 8 years older than her mother. We have one last link. The Yad Vshem testimony was submitted in 1999. I have a contact name and address. I know the person who submitted it would probably be in her 80s now. But I plan to send her a letter with our information and copies of the three photos I have. Perhaps we can make a connection. The Mysterious Kalsbad Photos: Who Are They? June 26, 1931. My Grandmother was in Europe with my Mother and my Uncle. She left them at the farm owned by my great grandparents in Poland while she went to Karlsbad (Karlovy Vary), Czechoslovia to take the waters and revive her health. The doctors in the United States told her that she was going to die. She had been pregnant again in the USA. But doctors terminated the pregnancy through a very illegal abortion in an effort to save her life. But still she was sick. So she decided she would not burden my Grandfather with two young children, 5 and 2. She would take them to Europe to live with his parents and she would die there. He, then, would be free to continue his life. “Would you have left Mom and Uncle Stanley in Europe?” I asked. This was a very important question. His entire family perished. If he had left them, I would not be here. His words made me feel a bit better. But if Grandma had died the world my Mom and Uncle lived in would have been very different. But at least I know my grandfather would not have abandoned them in Poland. Luckily Grandma did get well. She stayed in Europe for six to eight months and then returned to the USA with my Mom and Uncle. She saw the rise of Hitler coming and now had a new purpose: get the family out. She could not save as many as she wanted. But she tried. Grandma is sitting in the front. The date and place were added by my Mom. I think the two women are related. This is the photo we knew about. We have several items from that trip to Europe. We have a ceramic vase that stays in her breakfront/curio cabinet in our Catskills’ home. We have stories about the trip. We have a few photos. We knew of one. Grandma is with two other women. We have no ideal who they are. But I think they are related to her, one women sort of looks like her sister-in-law. We are not sure. There is no identifications on the back. But I recently found another. Grandma is in back row on the left wearing a white hat. It is a group photo. In the very back row, near the center is a woman in a white hat, that is my grandmother. She is 26 years old. I do not know the other people. Are they family members who perished? Or are they just other people who are in Karlsbad? Sometimes I imagine that they are just other people at the resort who were pulled together for a group photo that the photographer would then sell to tourists. Other times I imagine that people in the photo look like family, especially the man in the front on the left. But I honestly do not know. This photo is different from the others we have from that trip. There is writing in Yiddish and English. The English is easy, her name and the address where she stayed in Karlsbad. Or is it a place she visited? Either makes sense. She was sick. She was away from my grandfather. She wanted to be reunited with her family and be healthy. And that all happened. She returned to the US and lived an additional 50 years. And 80 years later, I keep finding treasures in her photo album! Bound Copies of the Bialystoker Stimme from 1922-1941. Several were personalized. I honestly thought that we had discovered all the treasures in our Catskills house. Last summer my siblings and I had torn the house apart, filling a 20-cubic yard dumpster with unused and unusable items. We had discovered a mother lode of photos and a photo album from the 1920s that I am still slowly scanning and finding more information about our maternal grandmother and her family. But I had forgotten about the old bookcase in the corner of the living room. I actually did not think about it until the very last day we were in the Catskills this summer, when I got a ‘jubba’ as my grandfather would say — a feeling that I had to open the glass door. My Grandma Esther’s bookcase in the corner. We now call it my brother’s bookcase. But in reality it was my paternal grandmother’s and before her it belonged to her parents. Since they lived in the same apartment, there was no real distinction. The bookcase came with the books in it after my Grandma Esther passed away. Over the years, new books were put in and the older books migrated to the bottom shelf. We have placed it along side the fireplace behind the television. 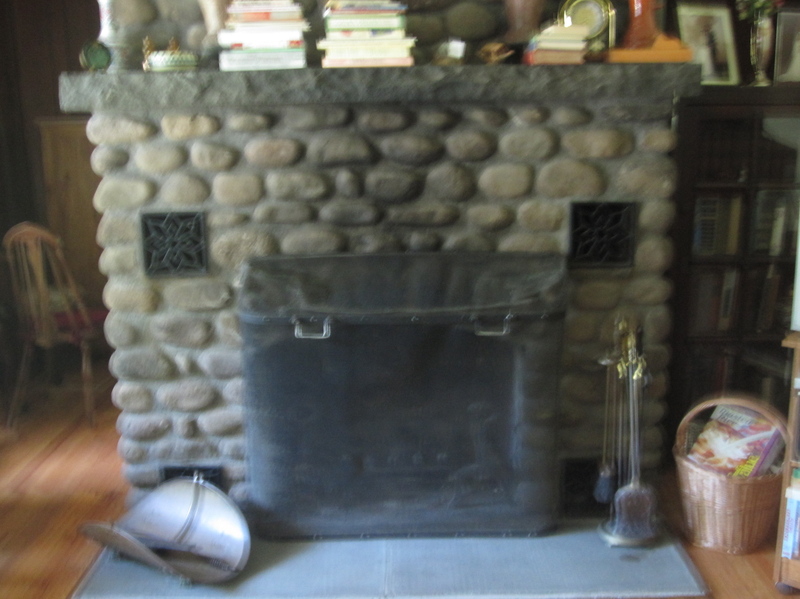 It acts as part of a wall, so that the area behind the fireplace can be used as a bedroom when needed. This semi-room holds an old upright piano, a trundle bed that opens up to two twins, and a computer desk. So we usually do not even think of this piece of furniture as a bookcase, but more of a wall divider. In any case, my ‘jubba’ called me over to the bookcase about an hour before we were planning to drive home. And inside of it, I found treasures! 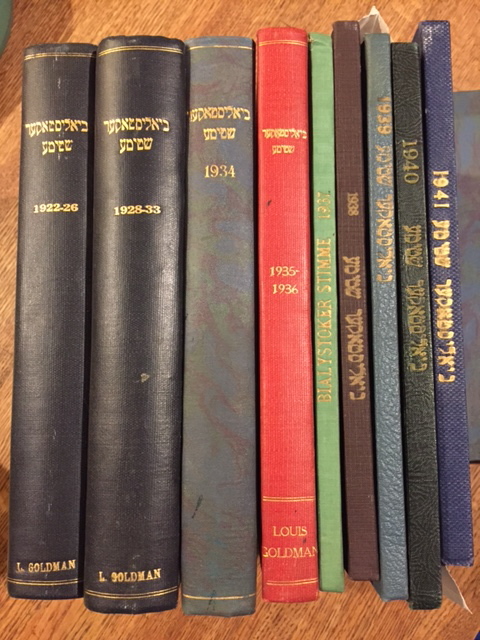 Nine books containing bound copies of the Bialystoker Stimme from 1922 through 1941, as well as a 45th anniversary book. 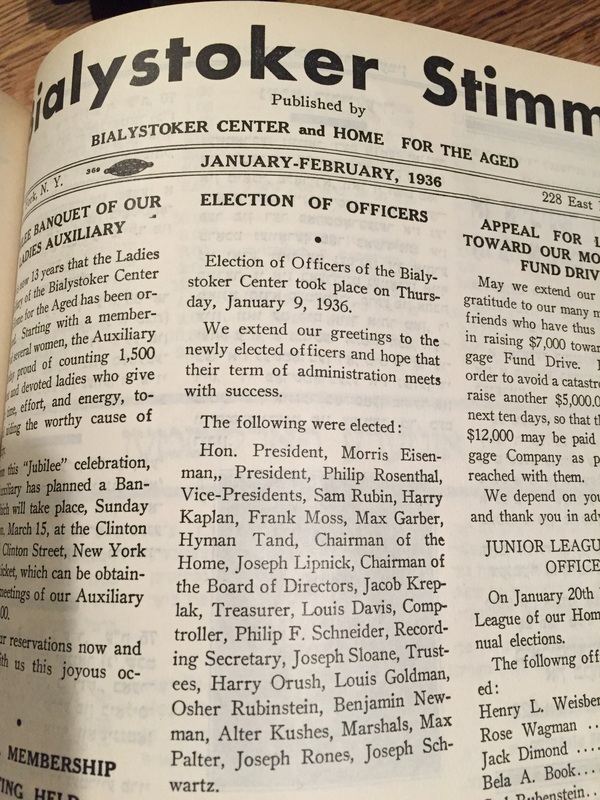 My great grandparents, Louis and Rae (Rachel) Goldman, were very active in the Bialyskoker group in New York City that founded the Bialystoker Home for the Aged. In fact, he was on several important committees and boards. My great grandfather top right. My great grandfather was elected to the board, or re-elected in 1936. Louis Goldman. While just skimming through the bound copies, I found announcements of both my Dad’s and Uncle’s bar mitzvah. These were in English. The Bialystoker Stimmer was printed mainly in Yiddish. But there were also a few English pages or a few English paragraphs in almost every copy. 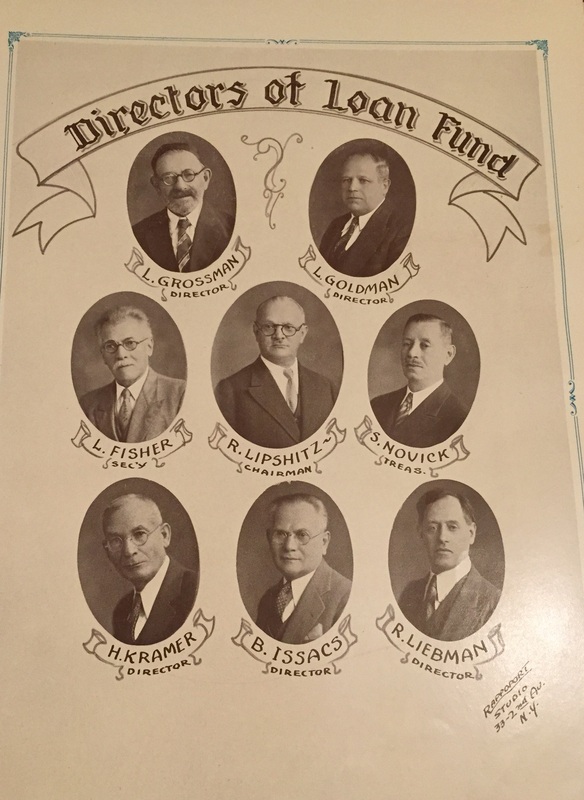 I also found photos of my great grandfather on several pages that announced committee and board members. 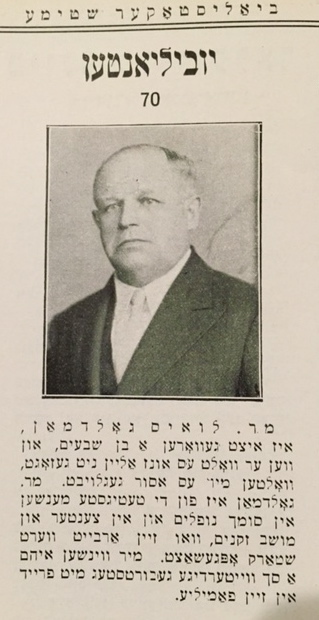 But the best was a photo of him and a paragraph in Yiddish celebrating his 70th birthday. I can read enough Yiddish to recognize his name and a few other words. To be honest, I do not know what it says yet. But I will find out. That was with just a quick skim. I needed these books. I told my sister that I had to ship them home and search them. Since we found the books in what is my brother’s bookcase, my sister sent him a text asking if I could ship them to Kansas. They both agreed that the books should come home with me, as I am acting as the family historian. I was so excited. It was well worth the $40 I spent at Staples to ship them home. An article about my great grandfather. I also need to get this translated. As I continued to go through the books, I found what appears an article about him. It, too, is all in Yiddish. I know I will need it translated. I am excited to know what it says about him. I know he was a tailor. My Dad’s first cousin, David, 1938. I think he graduated high school at age 16, but I need a translation. I cannot read all the Yiddish, except really for the names and a few words. But in skimming the books I sometimes see a photo that jumps out at me. Like the one of my Dad’s first cousins, David. Well, it looked like a very young David. I was right, it was him at age 16, when he graduated high school. This article is also in Yiddish. I need a translator!!! I realize that I will never know if my great grandparents were mentioned in other places. But I am taking photos of every page that has a photo or a mention of my family that I can find. But besides the book, I posted the photo of my great grandfather Louis Goldman and the small article on the “Tracing the Tribe” Facebook group. I was hoping someone would be able to translate it for me. Although that has not yet happened, I remain hopeful. But someone posted a link to the Bialystoker Center Yahrzeit Cards website. There I found the yahrzeits for my great grandparents, my grandparents and my great aunt. I will say that the Hebrew name for my grandfather is wrong on the site. But it is definitely him. That was also interesting to see. I started with the books from the 1940s, I am now in the 1920s. There is much more Yiddish and much less English in these earlier books. I am hoping to still find more treasures in them. But to see members of my family mentioned in these early archives makes me so happy. I knew my great grandfather was an active volunteer. These books confirm what I had heard. My heart is happy. I hope to find a good home for these books after I am done investigating them. There are many other families mentioned in the books. I do not know how many people saved them. In our case it was benign neglect. We did not know they were there, so they were just ignored. And allowed to survive. A happy, lucky find for me and my family. PPS: The Yiddish Book Center in Amherst, MA, would love to have the Bialystoker Stimme books! 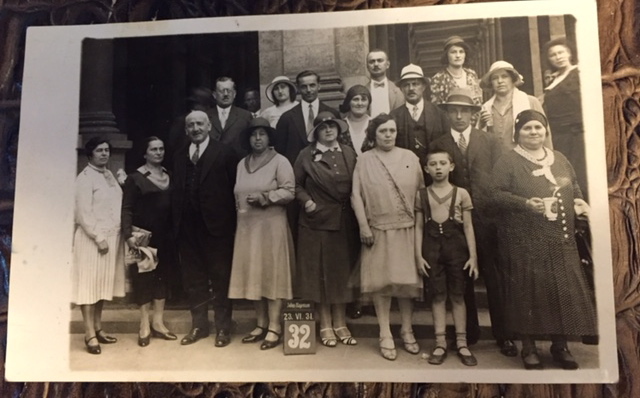 When my maternal grandmother immigrated to the United States in 1922, she was sponsored by her father’s sister: her Aunt Gussie. I wrote about this in another blog, which I will reference at the end. Grandma became very good friends with her first cousin, Katie L. They remained friends throughout their lives, even though they did not live near to each other. But the letters and phone calls seemed to keep their love for each other in tact. Katie’s married name was Katie Alexander. That is the name we always heard, and this was the name we thought of when we spoke of Katie. It was so ingrained in our lives. Grandma loved her cousin, Katie; she spoke of her often! I think my sister was the most in love with the name. She named her son, Alexander. And four years later, she named her daughter Katherine, or Katie. My Mom at first said, “How can you name her Katherine?” My sister was naming her daughter after my grandmother, whose name was Thelma in English/ Tova in Hebrew. My sister reminded my Mom that Katie was Grandma’s friend and cousin. And since she did not want to name her daughter Thelma, she thought she would use Tova as the Hebrew name and Katie, Grandma’s cousin’s name for the English. I laughed. I often tell my sister that she named her children for Katie Alexander. And so the name stays alive in my family. 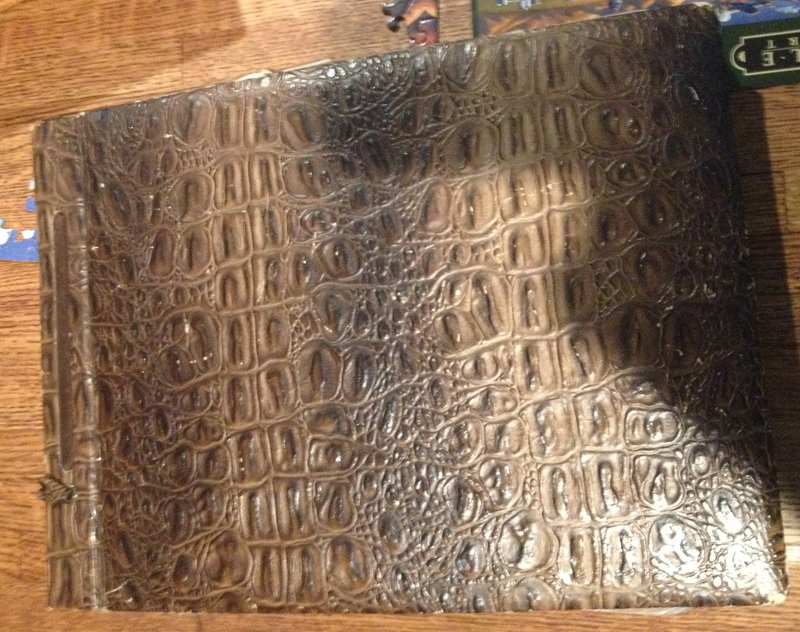 Last summer, while we were cleaning out the attic of the Catskill’s home that had been both our grandparents and parents, we found an old brown leather photo album. It was filled with photos from the 1920s. Many had no names. Some had Yiddish or Hebrew writing on the back. Some had just an address or a place. But within the photos was a photo from 1924 of Grandma and Katie. That was it. I decided I had to find out what happened to Katie Alexander’s family. Thanks to the Tracing the Tribe Facebook group, I now have that information. The wonderful members of the group found members of Katie’s family for me. And then I contacted them. I have been in touch with one of her sons, a niece and a granddaughter. I have found out that another name we often heard in our home was Katie’s brother. We never knew Katie’s maiden name. She was always referred to by her married. But I realized after I send them some photos, that the Sam L. that my grandmother spoke was Katie’s brother. WOW! I am hoping that they will be able to identify more of the photos in the album so we can put names to those nameless young men and women who were so important to my grandmother. I am so happy we were able to find Katie. Overwhelming, amazing, stunning, these words cannot really describe my incredible journey in researching my family history. And I have only finished two of my great-grandparents. I wonder what will happen when I research the other six? Since researching one of my paternal great grandmothers, actually the one I knew as a small child, I have been really shocked. I have lived in a city in the Midwest far from my family on the East Coast for over 30 years. And in the past month my research has shown me that a branch of my great grandmother’s family settled here. We just lost touch with them. But what is absolutely amazing to me, is that I know many of these descendants. I have volunteered with them, emailed with them, see them around town. I am Facebook friends with three of these distant cousins. They are all people that I like. One of them played an important role in the life of my son, as she was an assistant superintendent of the school district where he went to school, during a difficult time in his life. And now I find out that they are my third cousins. I know that is not a close relationship. But they are my cousins. And in Israel, where my daughter now lives, it is her second and third cousins who have reached out to her and consider her family. But these cousins in Israel are all family members that we remained in contact with over the years. We always knew who they were and were they lived. The cousins in Israel come from both sides of my family and my husband’s family. We knew we were family, cousins. With the new contacts it is different. These new family members were unknown, but at the same time known. These are people I had contact with in many forums, people who have had some impact in my life, and I never knew that they were also my cousins. How strange is that? To me it seems extremely strange. But it makes so much sense. The Internet has changed the world. Before in the 1800s and early 1900s when people moved to the USA from Europe, they had no way to keep in contact, except through mail. And mail was not always easy. They were busy learning a new culture and a new language. It was difficult to keep in touch with relatives in New York or even in Europe. So the family ties were forgotten and lost. With the Internet and the many ways to trace family history, these lost members are found. Through websites and Facebook groups, we can make contact. It was through the ‘Tracing the Tribe Group” that I made the first contact. But it was through Geni, that I keep seeing more and more connections! It is these Internet tools and their large outreach that enhances my ability to make these connection. Those who know me, know that I love a good mystery. And searching for my family connections is the most personal mystery. Although I am glad I have found this family branch, it is more of the success of a hunt, of finding the answers to a mystery, the mystery of my family that excites me. How lucky am I that I can actually find new branches? When I look at them now, I can see a resemblance in character. Every one of the four women I know are strong willed, determined and intelligent. They fit into my family, as my grandmother was a strong willed, determine and intelligent woman who worked until she was 77. In fact, we take pride in my family that we are all strong women. And these four fit right in. Wow. If I could choose family members, I would choose women like them. I plan to meet up with some of them next week for lunch. I learned they were my cousins several weeks ago. The other cousins, I just found out about this weekend when Geni sent me a match! It is nice to know that I have connections here. I will look at them differently now knowing what I know about our large family. The connections keep widening and my family contacts keep growing!